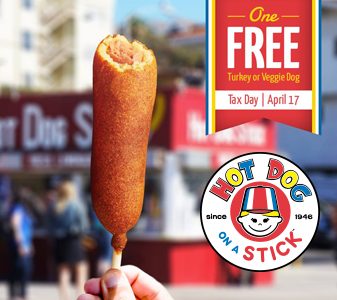 Get a FREE Original Turkey or Veggie Hot Dog on a Stick on Tuesday April 17th! No purchase or proof of completed taxes necessary. Valid at participating Hot Dog on a Stick locations only. 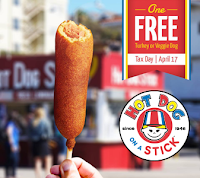 Offer is valid for one free Original Turkey or Veggie Hot Dog on a Stick per customer.